Could you upload the cbs promo video again such that everyone can watch it? I found it on Sling, but I don't want to embed it from there. It's still the CBS version, but I don't know if it has the same viewing restrictions. PS - I'll let someone else decipher the whole thing, but the end of the text is "They built this Polynesian haven and they called it Tonga!" Hmmm.... I have no idea about the order of the tasks, but at the top of the hill where they are carrying the trunks are several old historic hotels. One of them (the Fairmont?) has a famous bar/entertainment lounge called the Tonga Room. That could be where they are going with the trunks. Or I could be grasping at a coincidence. I'm at work, so I can't look into this. I'll leave that as an exercise for the readers. Could it be the Tonga Restaurant and Bar. We'll do what we can, no need to keep asking .... try the link chills gave you? "A long time ago, on a hill far, far away, soldiers returning from the South Pacific demanded a place where they could relive perfumed nights spent beneath palm trees and cooled by the fierce ocean winds. They built this Polynesian haven and they called it Tonga!" Thinking that the goal of the VR game could be to find and read this message to give them the location of their next clue? The Tonga Room makes most sense to me -- it's a landmark and matches the description in the clue (it opened in 1945, just after WW2). to plaidmoon and jerseydude. Plaidmoon, I'm thinking the Tonga is maybe where they get the trunks? Since we know they don't have them when they get to Lucas and they go to Tonga right after Lucas? To me it sounds like Airport -> Coit Tower -> Lucas Films -> Tonga Room -> Take trunk to Great American Music Hall or Curran Theater or somewhere near by for a memory task with the trunks? - Then to the pit stop at Candlestick Park (or Monster Park or whatever they are calling it these days). I'm thinking the Tonga is maybe where they get the trunks? Agreed. The Tonga faces California street; one team heads west, the other south. Great great job guys!! LOVE it! Take another look at Chateau's stuff--by Chateau's times, we have Lucas films, Coit Tower, then trunks right? Or do I have it bassakwards?? I know from **coughcough** the day that Coit tower was pretty done by 1130...and Lucas seems to take a couple of hours, so thought trunks came after Coit...also by Tweet times (all that is in post 1). Just took another look...Tower done by 1110-1130. Trunks after tower per Chateau. They're walking away from the Tonga--and if the strain in the promo caps is any indication, the trunks are empty (or nearly so). So I'm thinking that might be Dan & Jordan, already finished with Coit Tower. Then Cowboys do Coit Tower at 10:45 (half hour before Brent & Caite) and catch up to Dan & Jordan at Letterman DAC. The airport tweets were at 09:00 and 09:15. The plane landed at 845.....and it is a 30 minute drive to Letterman according to Google earth. About 915 is quickest they could get to Letterman, without taking into account Immigration and Customs at SFO. Chateau is sure the guard told us 940, I honestly don't remember. I do know that Coit Tower was donedonedone by before 1140. He can't check in today, maybe tomorrow we can sort this out. He is very sure about his shadow times at Coit Tower and wlil plot those for us. Customs will be an issue for the second and third teams, I think. A time for this image would be helpful. I think that Tonga is just a miscellaneous route info. Teams could be getting the trunks at the Coit Tower and be hoofing it to the Great American Music Hall as per the original speculation. If the next destination after the hall is the park, then I believe there will be enough time to fit one more task...a geography task would be fitting for this race. Also we had eyewitness accounts of Brent and Caite leaving Coit Tower...no trunks. Music Hall is spec...it may just be a place in the vicinity, there are LOTS of theatres near there. But it is pretty non-descript around there. You could make it to Letterman on a Sunday AM in 30 minutes or under I think... from SFO. 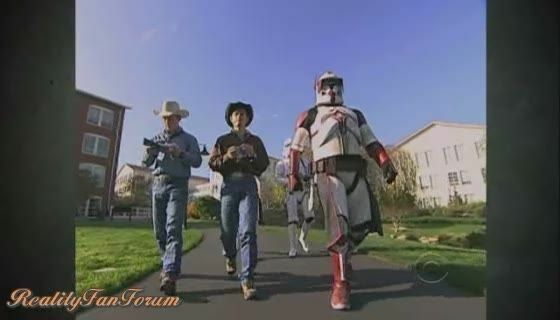 Teams go from SFO to the Letterman place, but the brothers lose their lead to the cowboys. Clue in VR tells them to go to the Tonga Room. According to sunlight, brothers manage to leave the VR before the models. After delivering the trunk somewhere (Pioneer Trunk Factory/C.A. Maim & Co. ?) they are told to go Coit tower. Teams arrive at the Coit tower in this order: Cowboys, Brothers and Models. Then Jordan has issues going up and models cut in the line, probably because there are only 2 lines to be climbed on at the task?